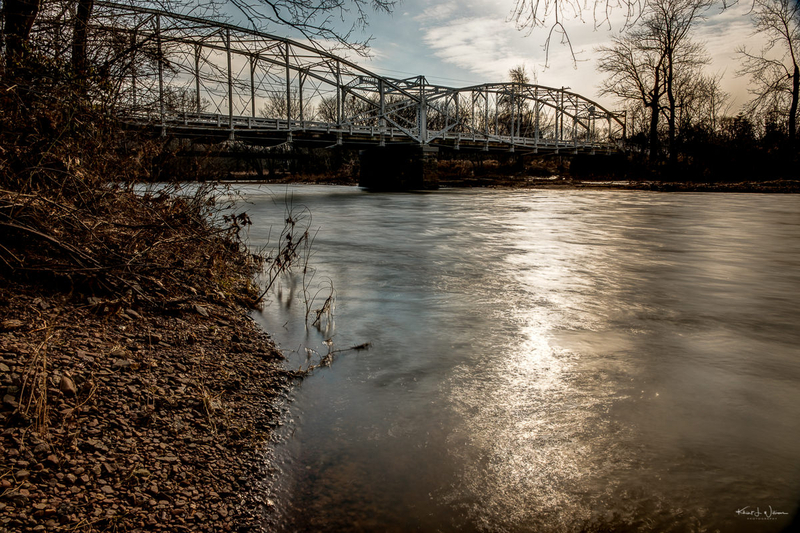 This Neshanic Station Bridge, also known as Elm Street Bridge, has been on my to-do list for several years. Every time I drive out to visit my brother-in-law in Annandale or stop in at Conclave Brewing for a pint I take a route that leads me through Hillsborough and Neshanic Station. On this occasion, I was returning from completing a photo project. 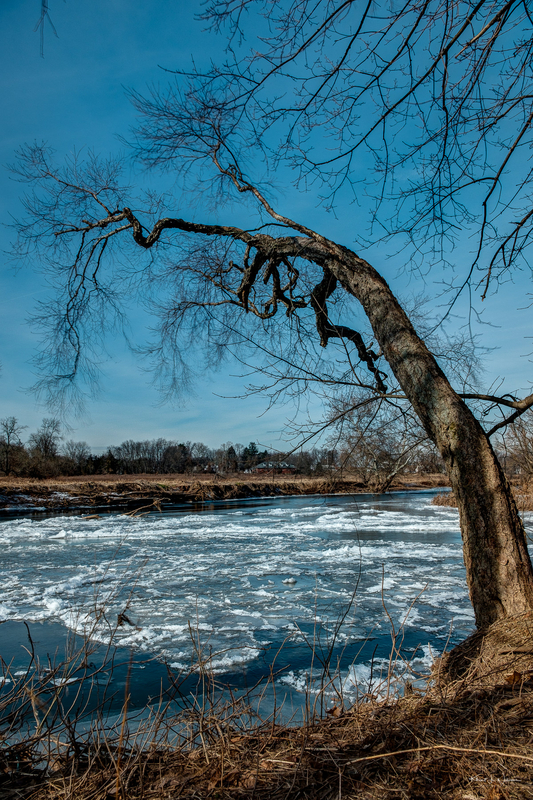 I had spent the morning photographing from the banks of the south branch of the Raritan River in Clinton Township. On the drive out to Clinton, I slowed down and paid attention for potential places to park the car and made a mental note to stop on the way back. The sun was lower in the sky when I started my return drive home. I parked on the shoulder of the road on the eastern side of the Raritan River. I could easily see the banks of the River. I grabbed my camera and tripod and made my way through the brush to the river bank. The snow or ice had melted, and the ground was muddy and slipper. I slid down to the river bank. I almost slide right in. My shoes were full of chunks of mud, but I set up my tripod and grabbed a few shots from a few locations. So what do I know about this bridge? 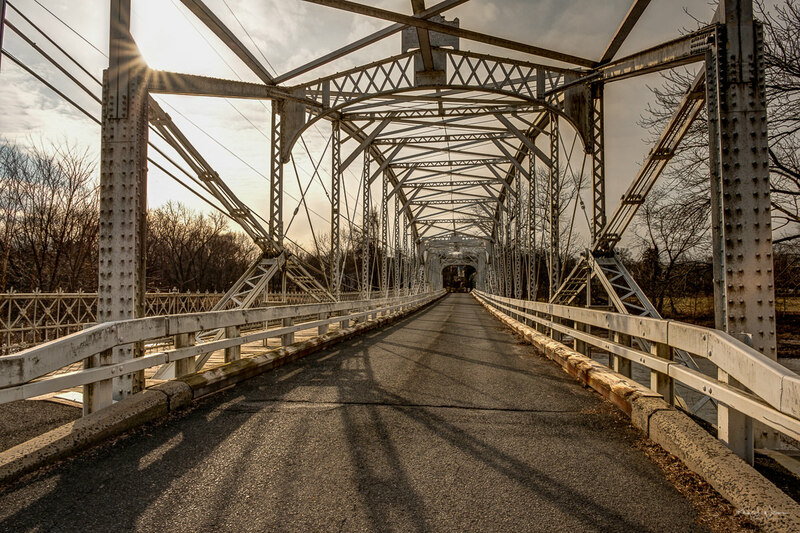 From what I gathered from various online sources The Elm Street Bridge is a lenticular truss bridge that carries Elm Street (Somerset County Route 667) over the river out of the community to River Road. Because of the length of the Raritan River, there are quite a few towns in New Jersey with a River Road. 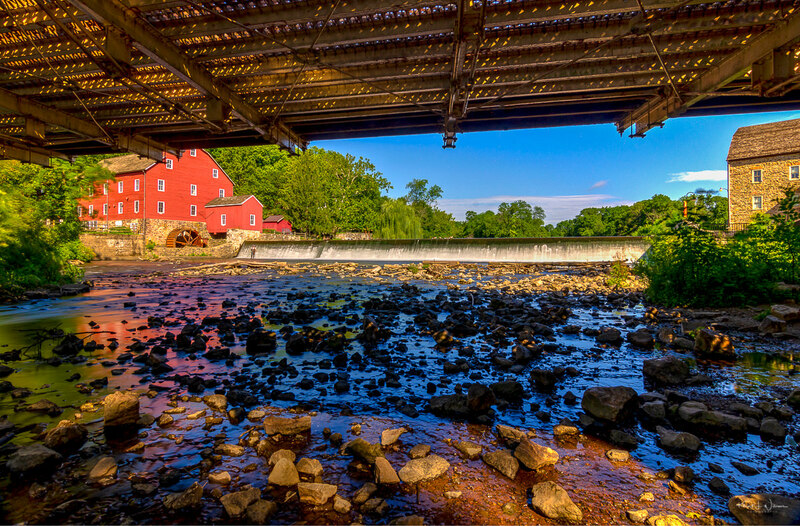 This summer I planned a photo field trip to the Red Mill Museum in Clinton with some of my photog friends. A few of us had been talking about shooting that location for quite some time. With the exception of Walt, we are all busy professionals. Walt is retired and perhaps has more free time than we do. The rest of us — Chris, Prasanna, and Ed — are balancing family and work and sometimes we just don’t make the time to get out with our cameras and pursue the hobby. So I sent out some emails and we agreed on a date a few weeks into the future. I was excited. This was going to be a good test of my new Tokina AT-X 116 PRO DX-II 11-16mm f/2.8. I bought the lens about a month ago but I have not had many opportunities to use it. It’s a DX lens which means it was designed to be used on Nikon crop sensor — DX — camera bodies like my Nikon D5100. The lens is equivalent to approximately 16-24mm full frame sensor lens. It was just me and Ed. Walt, Chris, and Prasanna didn’t make it. Prasanna was concerned about the heat, Chris forgot he had other obligations and Walt simply forgot. Ralph Hunt built the earliest section of this Mill to process wool sometime around 1810. His wool business failed, however, thanks to a permanent downturn in the market for domestic cloth. By 1820 Ralph confessed to the Census that “the establishment has been doing very little for two or three years past. The demand for the sale of the cloths and sattinets are very dull…a few of the farmers get their wool manufactured, but from the low prices of foreign cloths.” Things did not improve and Ralph lost all of the family’s property, more than 400 acres and mills on both sides of the river. He defaulted on his mortgage, and the Taylor family took ownership. Ed showed up just a few minutes after I did. 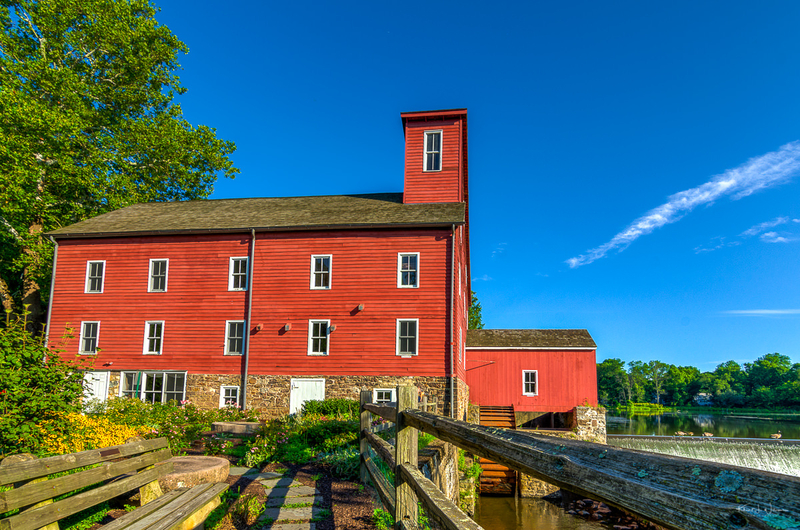 We set up outside the Red Mill with Ed shooting across to the Hunterdon Art Museum while I focused on getting a shot of the Red Mill. Having a wide lens really helped here. We then headed toward the metal bridge. It took us almost 45 minutes just to cross the one-way metal bridge. Ed and I set up our tripods on the bridge to get some long exposure shots. The sun was quite bright at that time of day. We used neutral density (ND) filters to reduce the light entering the camera. This extended our exposure times to between four and eight seconds. When I am doing long exposure shots the tripods helps eliminate movement of the camera which can cause blurry captures. However, as cars slowly drove over the bridge, it would vibrate. We had to time our exposures just right. 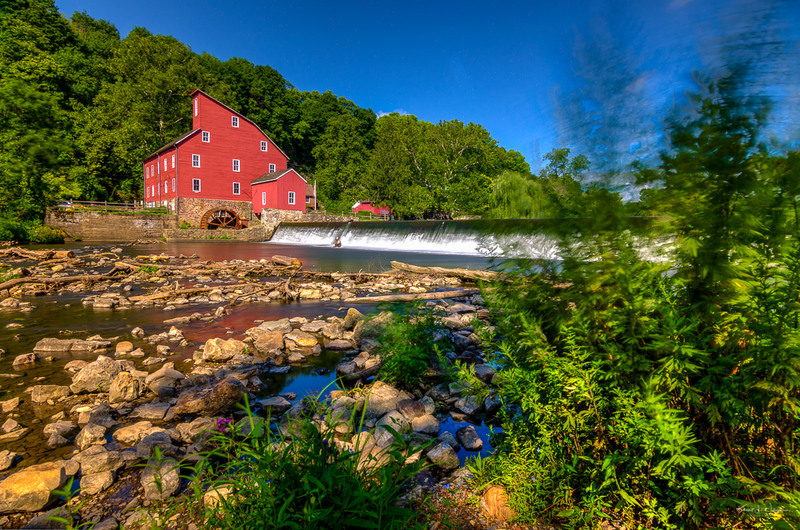 My Tokina was wide enough to get a shot of the Red Mill Museum on the side of the damn and the Hunterdon Art Museum on the other. However, my ND filter — a 10 stop Hoya 77mm Pro ND 1000 — causes a bit of vignetting at the 11mm end. This sometimes happens with big stop ND filters and wide angle lenses. The Tokina also exhibits some barrel distortion at the wide end. I decided to shoot the scene as a panorama. I zoomed out to the other end of the lens range — 16mm (~24mm full frame) and swivelled the base of the ball head. I shot four images with my Nikon mounted in portrait orientation and created the panorama in Photoshop. I’m surprised it came out as well as it did. The Tokina has some very slight barrel distortion when shooting at 16mm ( ~ 24mm full frame ) and I was shooting of the axis of the camera body which added some additional distorting. Nothing that could not be fixed in Lightroom. Once we crossed the bridge we set up on the view area near the courtyard of the Hunterdon Art Museum which was closed. I did not like the angle so I walked down to and under the bridge where I saw some fishermen. I used the bridge to frame a view of the shots. Bhavna didn’t like these as much as I did. Later it started to get warm. Prasanna was justified in staying home. The heat and humidity were exhausting. I think the outdoor temperature soared to about 98ºF but with the humidity, it felt more like 104ºF. 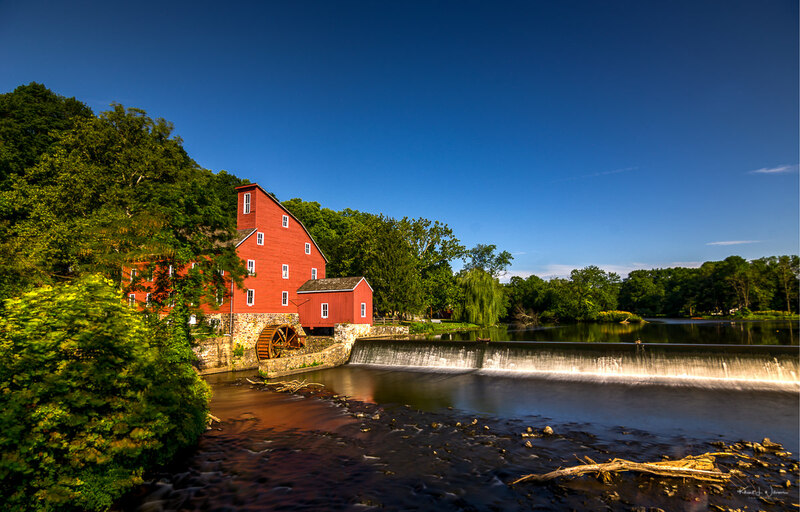 But Ed and I had persevered and got some good shots of the Red Mill Museum from multiple angles. We attempted some street photography but we succumbed to the heat and ended up at a local cafe for ice coffee and scones and conversation. Ed remembered seeing a photo online with the sun setting in the background. We discussed the possibilities for how that could be done and realised that east was slightly off the far right side of the Red Mill and we think it’s definitely possible to do a sunset/night shoot. We both agreed that we should wait until the fall to capture some of the fall foliage in the background. You know, I really do enjoy going out on field trips with people I know. It’s fun. Quite often I learn some new photography technique or a new tool or discover a new place to dine or visit with my family. This is one of the reasons I originally joined meetups. I enjoy the social aspect of photography.